So what do consumers expect from local businesses online? We set out to answer this question for our clients and readers, by researching studies that utilized a large sample of consumers to get input on local businesses. What we found was extremely insightful and we think you will find it helpful for your small business too! What Do Consumers Want From Small Business? A huge 82% U.S. consumers said that they’ve used a local business in the last year. More important 56% of of consumers total business use over the last 12 months was with local small businesses, as compared to 44% with national chains. Consumers really want to spend their money with local business, of the price, quality and service are either superior or inline with national chain stores. Additionally 47% of consumers surveyed said that they are using local business more versus the previous twelve months, while 51% are maintaining the save level as they were before. The future is even brighter, showing that 48% of consumers plan to use local small businesses even more over the next year, and some 90% said they had done so within the last month. The local business use numbers above should provide the local business owner with a bit more confidence in their local market as well as some comfort that their local consumer is willing to support them. However, in order to get those customers in YOUR local business, they have some expectations that your small business must meet. According to the study, consumers stated that small business is not meeting their expectations for what a web presence should be. In fact, 67% of consumers said that an improved website, website experience (including mobile website improvement) and/or a completely new website was the most important online expectation improvement that local business must make. This issue was the number one issue that consumers said needed improvement and by a large margin. The next closest answer of competitive pricing received a 54% response. This reflects the frustration many consumers are experiencing when trying to research a local business as they are considering doing business with them. Far too many small business websites have not changed in years, even though consumer behavior, expectations, as well as technology and marketing requirements have. This was made evident through the 56% of consumers surveyed who said that over the past 2-3 years they had noticed this change. Would you believe that 76% of consumers consider online reviews as expected or something that sets a small business apart from their competitors? It’s true! In fact, consumers now expect to find detailed online local business reviews and think it is an important factor in their decision to use a local business. Here’s how the numbers break down on local business online reviews: 40% of consumers consider seeing an online local business review a requirement to do business with a company and 36% said it seeing online local business reviews sets a business apart, while only 24% said that it wasn’t important to their local business purchasing decision. What’s more, 60% said that being able to leave an online review either sets the business apart from its competitors (21%) or is expected of a local business (41%). Local business online review platforms need to be established and maintained, it is not longer a choice. Small business owners need to make this a priority in their online marketing strategy and see that it not only gets done, but is maintained properly to get the biggest benefit from online reviews. 57% of consumers said that special offers that are specifically for returning customers is the biggest differentiator for small businesses. Even 31% said it was expected, if not the biggest differentiator. Just having special offer incentives for returning customers isn’t enough if you are not able to communicate with them. Small businesses need to do a much better job of building customer lists for email and direct mail marketing opportunities and have a website that can receive traffic from these and other marketing efforts such as social media, in order to make it most effective. The consumer behavior, preferences and expectations that were uncovered in this thorough study should be providing a wake up call to small local business owners across the country. Do it yourself websites, social media and direct marketing programs are underperforming customer expectations. In an increasingly sophisticated online marketplace, mobile customer behaviors and research focused consumers, small business is going to have elevate their online presence in order to meet these expectations in meaningful ways. 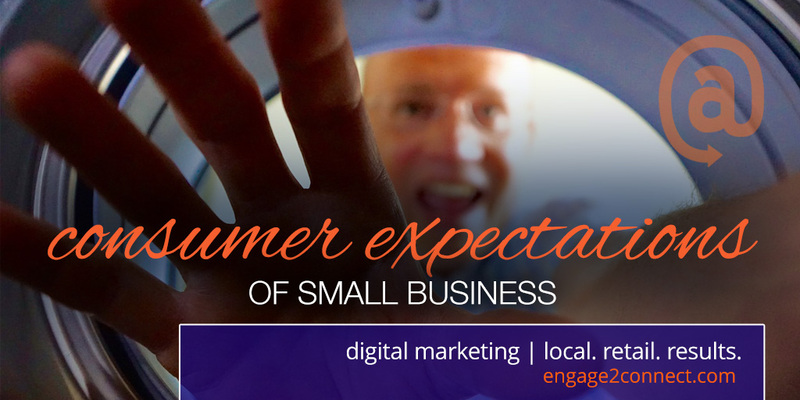 Do you know what consumers expect from local businesses today?